Embrace your parental superpowers with the 2018 Honda Odyssey, which truly tricks out the practical minivan. A brand new look, some magical seating options, and new convenience and tech options make driving the Odyssey way more than practical--it might be bordering on cool. The newly redesigned 2018 Honda Odyssey is the best yet - which is saying a lot, since the previous generation already gave the competition a solid run for its money. It starts with three roomy, comfortable rows of seating. The 2018 model, however, made magic of the second row with Magic Slide. Now you can move them sideways, forward, and backward, giving you endless configurations to make third-row access and family seating easier. The 2018 Honda Odyssey believes in equipping you with safety options. The Honda Sensing suite boosts driver awareness with radar-based technology designed to spot danger before it can become an issue. For example, the road departure mitigation system detects accidental drift and intervenes to keep you on the pavement. Similarly, the collision mitigation system intervenes on your behalf, applying the brakes to help you reduce or avoid damages. In the tech department, the parent-friendly odyssey continues. The new rear-seat video surveillance camera, Cabin Watch, gives you a wide-angle display of the second and third row to show you exactly what is happening. After the sun sets, flip on the night-vision controls so nothing gets by you. Need to talk to someone in the second or third row? Use Cabin Talk, an intercom system that keeps your voice intact while letting you get your point across. It picks up your voice via a Bluetooth microphone and projects it over the rear speakers. The intercom also sounds over the entertainment system headphones, so no important announcements will be lost. The new 2018 Honda Odyssey powertrain options boost performance without sacrificing fuel economy. In spite of a bump in engine output, the Odyssey still earns 19 city/28 highway mpg. The brand new 10-speed automatic transmission is smooth and responsive, dishing out speed at your request and delivering a smooth, quiet ride when you're just cruising through life. 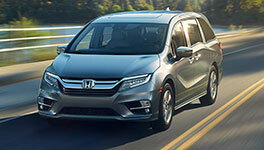 Seriously--the Honda Odyssey Elite is as tricked out as a minivan can get without gold plating or a snack bar on board. You can tick off the "normal" upgrades: heated and ventilated front seats, an 11-speaker audio system, power moonroof, a rear entertainment system, and a hands-free power tailgate. Add the Honda Sensing system, which helps drivers stay safe with a wide variety of driver assist features, and parking sensors and driving becomes much easier even with rowdy passenger in tow. But Honda takes it up to another level with some very cool features, like Cabin Watch and Cabin Talk, which allows you to keep an eye on passengers with a camera and talk to the third row without screaming over the DVD or radio. The HondaVAC, the internal vacuum system housed in the cargo area, is every mom's dream and the Walk Away Smart Entry system allows you to keep the keys in your pocket and still access your car when it senses that you're approaching. If you've ever had your hands full of cargo and kids--as anyone with a minivan has--then you know what a dream scenario those are. Honda is thinking about its target audience and meeting needs they didn't even know they had. Less box on wheels and more aerodynamic angles, the 2018 Odyssey has been redesigned and restyled. Minivan drivers have their hands full, so you need features that don't require even more effort. One button moonroof controls make it easy to bring the outdoors in. The second row in the Odyssey does almost everything, with options to remove a middle seat, slide outboard seats toward the middle, or move the driver's side middle seat all the way to the front. These options make it easier for passengers to access the 3rd row or for drivers to access kids in car seats while on the go. With a 10.2-inch screen, the rear entertainment system can be controlled by a smartphone app and has a "How Much Farther?" feature that helps back row passengers see how much longer the trip will last. Modern minivans might have a lot of competition, but there's still no better option for big families and new parents than the 2018 Honda Odyssey. With the 2018 model, the Odyssey gives you Mary Poppins-like power over your busy lifestyle with intuitive, thoughtful features that not only seem cool but make life easier while providing you with the comfortable, practical minivan options that you can depend on. Honda is clearly ready to dominate the market with the 2018 Honda Odyssey.